And we’re back with our second installment of Ask-a-Salty: the feature where…surprise! you ask questions and we answer them for you. If you have a question you’d like to ask, check out this page! Hi Salties! One thing I have been thinking about lately is how do many racers carry their gels? I was curious what the Salties might have to say. Also, on a similar note, I was wondering whether or not to carry hydration during my upcoming marathon. Right now I am thinking if weather conditions are good I will not carry my own water but if it’s going to be hot I will. Also I’m running Chicago (like Mint!) which is a huge race. Is there anything I should do differently for a huge race to make sure I get enough water? Thanks! Alternatively, you could put them in a belted pouch, like a SPI-belt. I have one to carry my phone and it’s awesome! I hardly know it’s there. I personally prefer the safety-pin-to-shorts method because you don’t have to worry about zippers catching or gel tabs sticking to you, etc., but if you don’t like the way the gels feel in the shorts then this would be the next best way to go. Spi-belt even has a deluxe version that has little gel holders! Cinnamon’s tried both ways, and says the pin-to-shorts method is more secure. Others swear by gels in the bra, which I don’t recommend because I’ve seen some NASTY chaffing from that! Camille Herron said she keeps hers in her gloves or tapes them to her hands! Those are other options. Now as to whether to carry water or sports drinks, I say no. Again, I like to keep things super simple on race day. If you want to race the marathon and run your best time, I really think weighing yourself down with fluids is counter-productive and unnecessary; drink as much from a cup at each stop as you can and that will be enough. Bringing a fuel belt, hand-held or Camelbak along for the marathon might make you feel secure, but it’s probably just weighing you down. The latest science suggests most marathoners are over-concerned about hydration. The most notable work on this subject is Dr. Timothy Noakes’ latest book, Waterlogged. I won’t get into all the science here as that’s for a more involved post, but if you enter the race well-hydrated you should be fine using the fluids available on the course. Keep in mind that it’s normal to finish a marathon somewhat dehydrated. If you drink from a cup at every water stop on a seasonally cool day, you should not suffer any ill effects from these normal levels of dehydration. The latest in sports science suggests drinking when you’re thirsty is more than sufficient to maintain a high level of performance. Even if you’re not racing and you’ll be out there for a long time, you shouldn’t need to bring your own fluids. Non-racers have the luxury of time to walk through water stops and drink as much as needed. HOWEVER– There are, of course, caveats! For a crowded marathon, I like the advice our friend Lloyd gave to Jen on our Facebook page: bring a throwaway water bottle to the start. Sip on it for the first mile or two, then pitch it. This will get you through those first few super-crowded waterstops. If it’s really hot, like Chicago ’07 or Boston ’12, then and only then would I consider bringing fluids in some permanent manner (e.g. fuel belt, handheld, etc.) Your time goals will be out the window anyway, so just getting to the finish line in one piece would be the goal and by bringing your own fluids you could again avoid the zombie hoarde at early water stops. Salty Readers, what say you? How do you carry your gels? 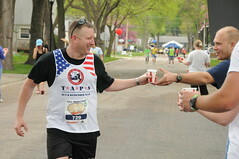 How do you feel about bringing your own fluids along for the ride during your marathons? Let us know what you end up doing, Jen, and be sure to fill us in on how your race goes! GOOOOOOOD LUCK and RUN FAST!!!! this post was originally published on October 1, 2012. 1). The jog bra thing does not work for me–I have had some nasty chaffing, even after just two miles! I carry mine in my little key pocket inside my shorts…or I make sure to wear shorts that have a zipper back pocket. (Many tight-fitted shorts have them, such as Nike and Pearl Izumi). The SPI belt works well too, and it doesn’t bounce like others. 2). For crowded races like NY, I carried a small, throw-away bottle to get me thru 2-3 miles. I have found that in BIG races like NY (and Chicago, in your case), the first 1-2 water stops are chaotic. I’d rather run thru them and take the water. By the third water stop, it seems like everyone has settled into their groove. Great question. As far as carrying gels, I usually pin mine to a race number belt. I don’t attach my race number to it, but use it exclusively for carrying my gels. That way I don’t worry about chafage or irritation from the pins or the gels. This time I am considering using a SPI belt with a zippered pocket, but I haven’t decided for sure. I also recommend carrying an extra gel or 2 in case you lose one (yes, it happens). As far as carrying water or sports drink, I recommend it even if it is not hot in a race. Carry a small bottle that is easy to hold and use that so you can ignore the first couple of water stops. Then toss it when you are in a good grove. I have done that since Lloyd first recommended it to me years ago and it really is good advice. Thanks for all the great suggestions! I tried the sports bra carrier method which ended in some bad chaffing at the River Run half. I think at this point I am going to use the pin method (carriers I’ve tried bounce or another belt I tried that’s supposed to stay down low on your hips rides up on me) and carry a toss-away bottle for the first few miles. Looking like it will be nice and cool although the low Saturday is now 36! Now I’m debating if I need to change my planned outfit-run skirt and tank w/throw away gloves and LS tee. Yes, your race outfit plan sounds perfect. If you are really concerned about being cold, wear arm-warmers. They are great because you can easily pull them down/off if you warm up. Sunday looks like a fantastic day for Chicago! It doesn’t look like it’ll be too windy (a bigger factor to me than temperature when talking Chicago), so your outfit sounds perfect. Good luck!! I personally wouldn’t bother carrying water for a cooler weather marathon, for all the reasons Salty said. I’ve run Chicago 3 times, and never had issues with being able to get water from the stations. The aid stations are huge and stretch for quite bit of the course. I’ve carried gels by pinning them to my shorts, using a Gu Pocket (a small pouch that clips onto shorts) and with a race belt/pack. Each method had it’s pros and cons, and it depends on how many gels you are bringing and how big each pack is. I like the idea of the throwaway bottle – good tip! I have an iFitness belt that I really like for carrying my gummies, and I know they make versions with gel slots on the sides. My problem with the belts with gel slots is that the gels always fall out – I pin them on to make sure I still have them when I need them. Agreed, Mint! And also if you pin them the little tabs don’t litter everywhere, which I like. I don’t eat gels anymore really, but I’ve used the method in the video for Spirt Beans too, with great success! My stomach churns badly when I use gel without it being diluted, e.g., mix them in water (but of course then you have to carry a bottle with the pre-mixed combination, which I don’t like to do). How to eat gels without sufficient water? What about shotblox or other chewy things? Too distracting? I carry my gels in the pocket of an insulated Nathan “speed draw” hand held. The hand held gives me the comfort of being able to sip at will, rather than over drinking at water stops, and drink after eating a gel to ensure that it goes down. (Incidentally, I have found Honey Stinger gels, recommended by Ginger, to be easiest on my stomach.) During the last couple of miles of the marathon, after the last gel, I toss the hand held so that I can run “free,” without the weight. By the end of the training season, it is pretty sweaty and ready to be replaced. I think mine get so gross that the washer doesn’t really clean them. Also, I have trouble getting the handle back on afterward. Sigh. Sounds like I’m the only lady where the “stuff the bra” method works. For both my marathons I put four gels in my bra (usually only need three). Maybe because I’m not well endowed? Of course I did try this on my long runs leading up and wear the exact same outfit on every long run to test it out. I’m doing my first trail 50k this year that has limited aid so I’ll be carrying water for the first time in a Nathan hydration pack. Looking at being out there 5-6 hours as opposed to 3 and halfish so real food is essential too. BUT for a marathon, or any other road race for that matter, water shouldn’t be necessary. Definitely make sure to test out the other hydration being used on the course. My training friends running Portland this year are trying out gummie bears and pretzels on our long run this weekend because that’s what is on course (weird it seems). I personally like to grab water at every stop. I snag two cups: 1 to get some sips on and 1 to toss on my head (depending on heat).